SAN DIEGO - Vice Adm. John D. Alexander, commander, U.S. 3rd Fleet (C3F) hosted Republic of Korea (ROK) Army Gen. Park Han-ki, chairman of the ROK Joint Chiefs of Staff, at 3rd Fleet headquarters, Oct. 22. Park's first visit to C3F headquarters focused on building familiarity and reaffirming the strength of the alliance between the U.S. Navy and ROK military. "We were honored to host Chairman Park," said Alexander. "The Republic of Korea remains one of our strongest allies in the Western Pacific and the conversations we were able to have here will serve to further strengthen our ties and increase our mutual understanding." Alexander and senior C3F staff members spoke with Park about the importance the U.S.-ROK relationship and its impact on security and stability in the Pacific. "The U.S. Navy needs credible, ready maritime partners to help preserve peace and prevent conflict," Alexander said. "Our partnership with the Republic of Korea exemplifies the cooperative relationships that are critical to promoting security and order, which in turn foster our collective prosperity." Park, the 41st Chairman of the Republic of Korea Joint Chiefs of Staff, also visited amphibious assault ship USS Bonhomme Richard (LHD 6) Oct. 23, where he received a tour and was briefed on amphibious capabilities. 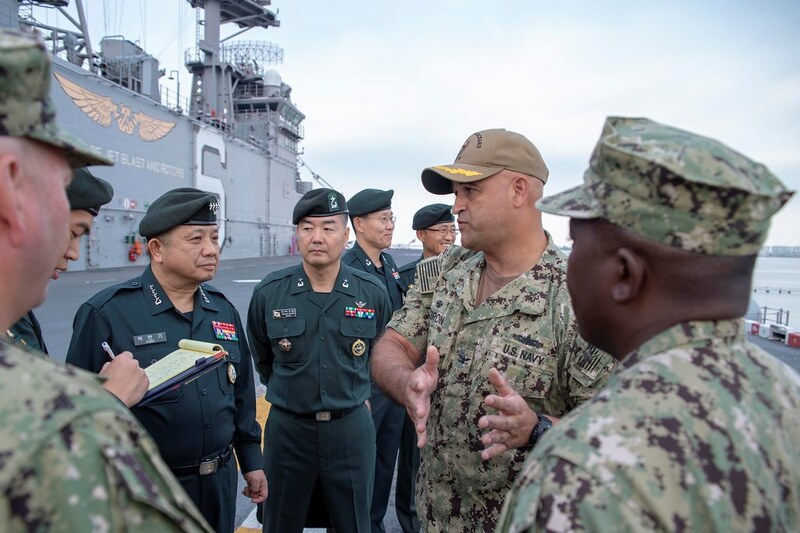 C3F leads naval forces in the Pacific and provides the realistic, relevant training necessary for an effective global Navy and constantly coordinates with U.S. 7th Fleet to plan and execute missions that promote ongoing peace, security, and stability throughout the Pacific theater of operations.